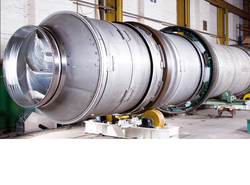 Our product range includes a wide range of rotary dryer, biomass rotary dryer and rotary drum dryer. Complete System of Rotary Dryer is automated where moisture content is adjustable. Rotary Drum Dryer also knew as a rotary kiln, is employed to reduce or minimize the moisture content of agro and forest waste, it is done by bringing it into direct contact with the heated gas. The rotary dryer is made up of a large, rotating cylindrical tube. The dryer discharge end is lower than the material feed to convey the material through the dryer under gravity. Rotary Drum Dryer is suitable to dry raw material which contains high moisture up to 50% and more. JK make Rotary Drum Dryer is specially designed to reduce or minimize the moisture content of agro and forest waste to 10% or less for briquetting, JK Rotary drum dryer combines the function of drying and cooling, thus save 30-50% energy. What kind of materials do Rotary Drum Dryers process? Rotary dryers are known as the replacement of industrial dryers. They are able to process a wide variety of materials and can lend a hand in nearly any industry requiring industrial drying solutions. Some of the most common industries and materials in which rotary dryers are employed include are typical material rotary dryers process include agricultural by-products & Waste, animal feeds, animal waste, Forest Waste, Paddy Husk, Coconut Shell, biosolids, concentrates, municipal sludge & municipal waste. How it Works?Hot air is generated by wood/ Briquettes. The material is conveyed by the screw at feeding point. The material is spread by lifters in a horizontal shell. Hot air is sucked by the fan through the shell in the presence of the wet material. With the rotation of the cylinder, the material flow down to the lower end with the effect of gravity and discharge after drying, at endpoint material comes out with the help of cyclone & Rotary valve with required moisture. Evaporated moisture goes into the atmosphere by sucking fan. Various models of Rotary Dryer are the available basis on Moisture content and production requirements. Complete System of Rotary Dryer is automated where moisture content is adjustable. After the damp raw material is put into the dryer from one end, it is turned over through string-up rake inside the cylinder and distributed uniformly in the dryer and contacted with counter current hot air fully. It speeds up heat and mass conducting of dry. During the period of dry raw material is effected by stirring-up rake with gradient and hot air. It can be moved and passed through the dry region and to star valve and then discharge the finished product. During the Drying Process, the best moisture content to pellet and briquette is about 13-15% and 11-12%, the function of the Rotary Dryer is to make the crushed pieces with suitable moisture. We can offer cost competitive designs for pilot scale units that process as little as one ton per hour to heavy duty units in excess of 7 foot in diameter that process hundreds of tons per hour.